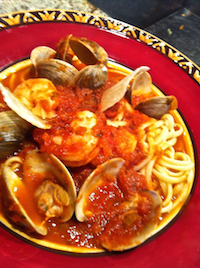 I like to serve fettucine in a huge platter, mixed all together with clams, shrimp and colorful tomato sauce. It looks delicious and everyone can just dig in and enjoy. Fra Diavolo is the name of a 19th century Italian opera. The name, meaning brother devil, refers to a real Italian bandit, a thief, Michele Pezza, “whose exploits during the Napoleonic occupation had become so well-known that folk memory ascribed supernatural powers to him”(Letellier, 2011). His character is fearsome, daring, fiery, outlaw. It is not clear when or where the Mexican chile was added to the Italian style tomato sauce, but the “Fra Diavolo” sauce is not of Italian origin. A cook, probably in NYC, (Fabricant, 1996) added the chiles, liked the fiery spiciness, and named it after that fiery Italian bandit. I don’t like that non-Mexicans have historically linked these bandit, outlaw traits to Mexican chiles, but there it is. I can see that the dish is indeed fiery and piquant. I use Chile De Arbol because it adds an earthy taste. If you have to substitute, find a chile that adds a balancing flavor, not just heat. Some recipes use Jalapeñols (Emeril Lagasse) but I think it adds too much herbal flavor to this dish. Chile Japonés, or even chile piquín will do fine. 6 cups (1 recipe) hearty tomato sauce in my previous blog You can also buy your favorite good tomato sauce in a jar, but no basil, no mushrooms, none of that stuff, just a straightforward Italian tomato sauce. 18 peeled, deveined shrimp, 26/30. This is 12 ounces by weight. I like Texas gulf coast shrimp the best but any shrimp will do. Method: These steps start from the point that the tomato sauce is already made or you are opening a jar of store-bought. 1. Bring a large pot of salted water to a boil and cook the fettucine according to the directions. 2. Add the Chile De Arbol flakes to the tomato sauce and bring it to a boil. 3. Add the clams and shrimp, return the sauce to a simmer and cook for 7-8 minutes or until the clams open up, are cooked and the shrimp, when sliced, is a delicate white color. Overcooking will make the shellfish rubbery. 4. Drain the fettucine and place it in a large platter or bowl. Pour the lush-looking sauce over the hot pasta and serve while it is steaming. !Gracias a Dios! Thank goodness for fresh seafood, Italian opera, pasta, tomatoes and chiles! Letellier, R. I. (2011). Daniel-francois-esprit auber: Fra diavolo. Newcastle upon Tyne: Cambridge Scholars Publishing. Hi, Larry. spaghetti alle vongole in Venice! Now, that’s living! let me know how this turns out when you get to make it. Adán, this looks delicious! Occasionally the seafood counter at my local supermarket has littleneck clams, so that will be the time I try this. I have all the other ingredients. I had awesome spaghetti alle vongole in Venice, the tiny clams brought from the sea that day. Best ever was in Naples, right by the seaport. This is a wonderful variation, thanks for sharing. Have a wonderful day, Adán.